Not too many bands share the ability to instinctively hit the sweet spot where only the most severe elements of death-metal, grindcore and punk converge. Surely one of the most thrilling acts of this rare breed are DEATHRITE from Dresden, Germany, who honed their knuckle-dragging savagery for four years now over a series of releases, including the highly praised „Into Extinction“, released through the esteemed German label Per Koro in 2013. 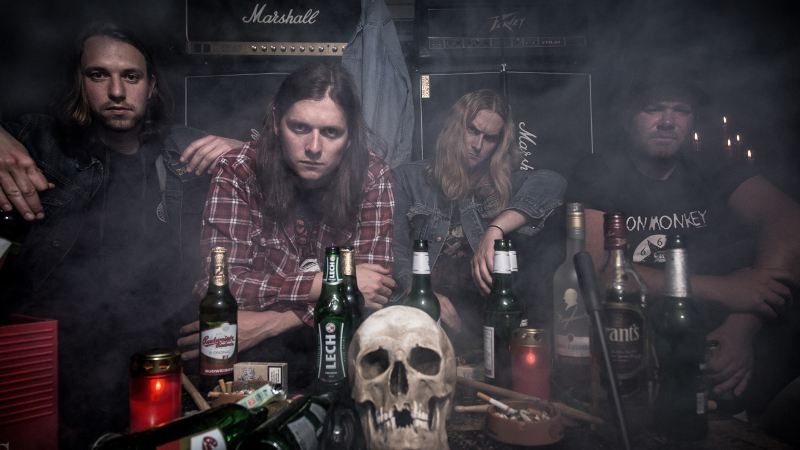 On numerous tours and countless shows DEATHRITE have played with internationally renowned artists like Napalm Death, Rotten Sound, Aura Noir, Mutilation Rites, Integrity and Full Of Hell, just to name a few. Coming from – and sticking to – Germany’s vivid DIY punk scene these four guys have never been afraid to add a huge amount of old school Death Metal riffage, Grindcore speeds and even hints of head-hits-concrete sludgecore villainy into the mix. The preliminary peak of this malign mixture is DEATHRITE’s newest album „Revelation Of Chaos“, that will reveal itself via Prosthetic Record in 2015. The outcome sounds like a beer and blood soaked Death Metal show that might very well have happened in a Swedish basement around 1992, including the trademark HM2 sound that hasn’t been presented in such a sordid perfection since Dismember’s “Like An Ever Flowing stream”. Yet the song-writing is so bare-bones to the point that “Revelation Of Chaos” will bring together Metalheads, Punks and Grindcore freaks at ease to destroy themselves in every mosh pit ever. Let the chaos arise.